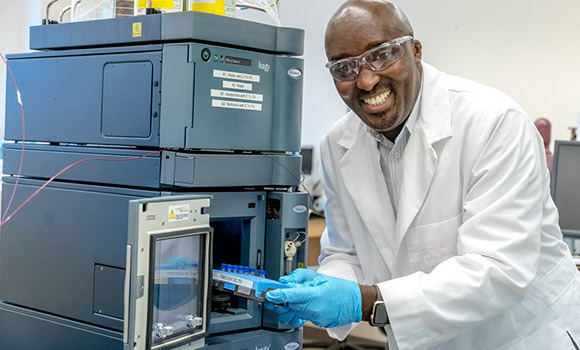 PhD student Joseph Mwangi loads samples into an Ultra Performance Liquid Chromatography (UPLC) system. UNCG is a leader in the research of medicinal biochemistry, and graduate research plays an important part in new discoveries and developments. In September, PhD student Joseph Mwangi received a competitive research grant from the Burroughs Wellcome Fund, which has the mission of advancing the biomedical sciences and supporting a diverse scientific workforce to advance research, innovation, academic discovery and public service. Mwangi came to UNCG as a scholar in the National Science Foundation-funded GK-12 program, through which he helped teachers conduct scientific experiments and convey the concept of cutting-edge research in the public middle and high schools in North Carolina. Before he was a doctoral student, he taught high school science in his native country of Kenya and in Japan. He was drawn to UNCG’s Department of Chemistry and Biochemistry because of the unique focus on medical related research work, and the notable collaboration within the department. In 2016, Mwangi won the grand prize for his research project at the National Organization for the Professional Advancement of Black Chemists and Chemical Engineers annual conference.